On Saturday, February 4, I spent a day traveling around the beautiful Netherlands by train. 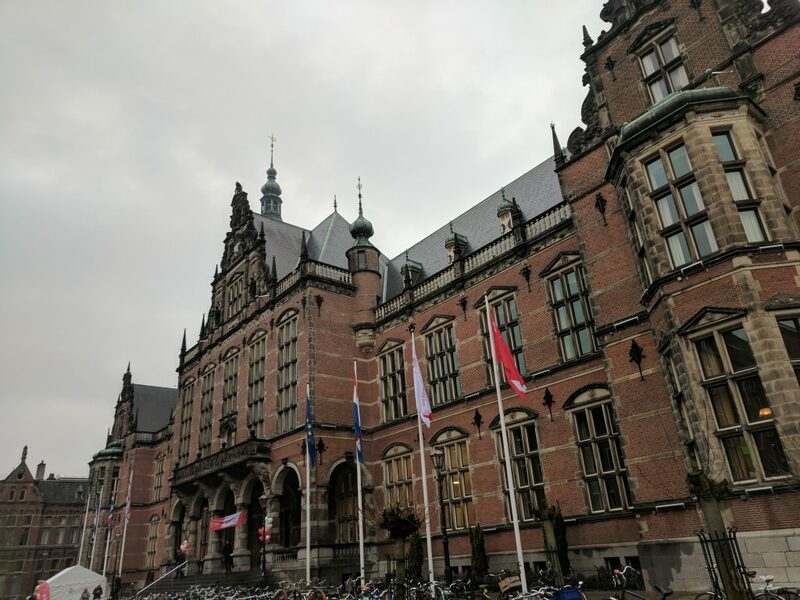 While in the city of Groningen to visit the University of Groningen for their open house day, and I found a great deal on a day ticket for all trains in the Netherlands. The day ticket normally costs 52,60€, but I found a weekend deal from the drug store Kruidvat for 14€. I decided to seize the opportunity of being in my favorite country by travelling around using my favorite mode of transport. 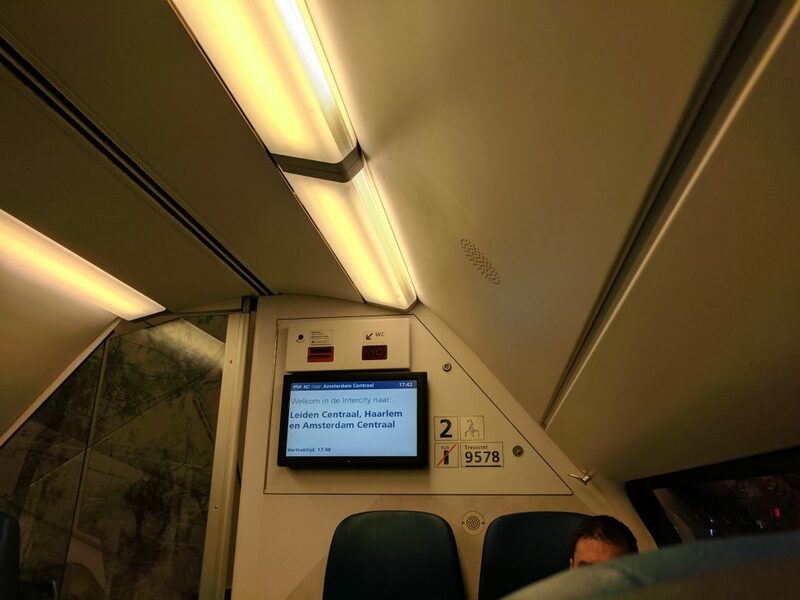 I started the day early in Groningen, taking a 7:48 Intercity train from Groningen to Leiden. Because Groningen lies in the northern Netherlands, this leg of the journey was the longest: around 2.5 hours. I arrived around 10:20 and went to the Leiden tourist information center (in the Netherlands, always abbreviated as the VVV for “Vereniging voor Vreemdelingenverkeer” or “Association of Tourist Offices”). The VVV is always my first stop in any new city, because I can get tips and ideas from the staff on where to go, what to see, and what’s going on. 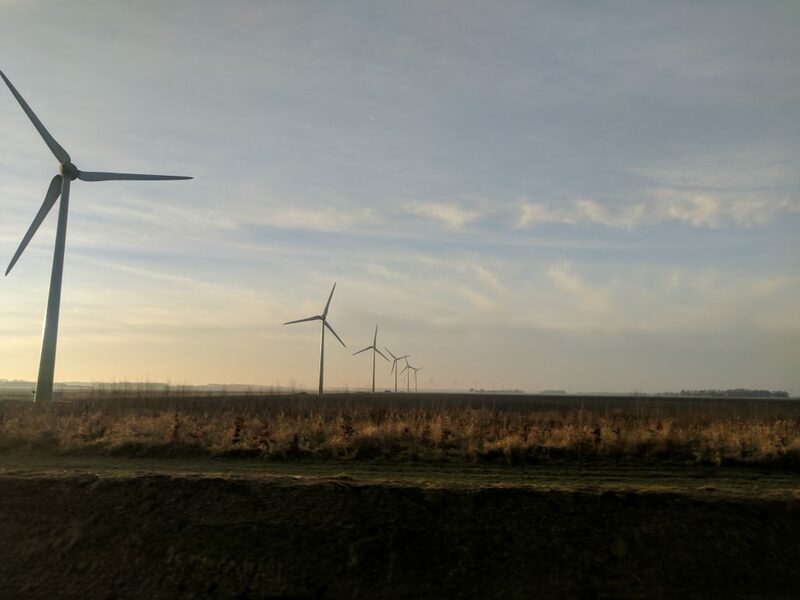 The beautiful Dutch countryside, complete with rows of wind turbines. At the Leiden VVV, they gave me a free map of the city and pointed out the best things to see and a nice route to follow for a few hours of touring. I walked along the canals and admired the beautiful canal houses and two windmills just outside of the old town. I saw the university building. Nearby, I found Leiden Urban 1, an old geocache that turns out to be one of the oldest I’ve found (hidden in 2001). I continued to the Pieters Kerk (St. Peter’s Church), which is a large church built in 1121. Although it was converted from a church into a general purpose event space in 1976, it is still a magnificent building. After the church, I went to the Aalmarkt and the Vismarkt, where the Saturday market was running. 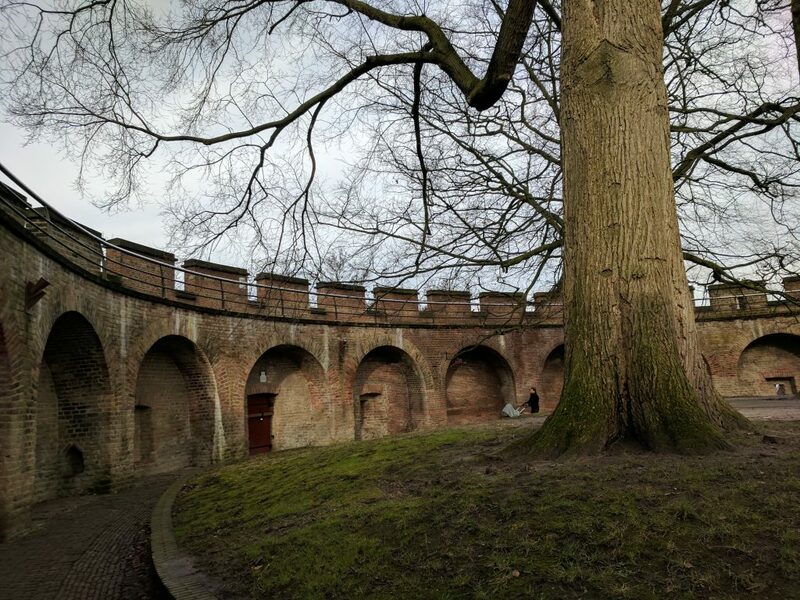 Right nearby, I climbed up a steep hill to the Burcht Leiden, which is the 11th century fortress of the original settlement of Leiden. Not only can you climb the fortress and see great views of the area, but there’s also an earthcache there which I was able to find. After the fortress, I headed back to the train station to catch a quick 13-minute hop over to The Hague. 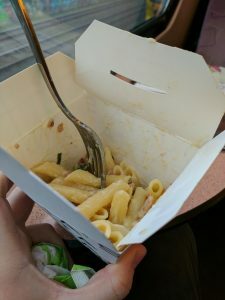 For lunch I had takeaway penne carbonara from a fast-pasta shop in the Leiden station. 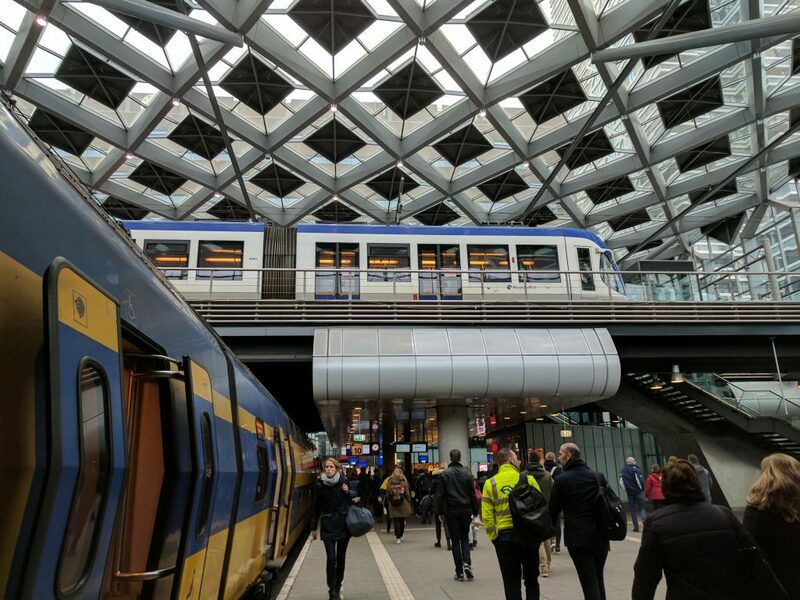 Upon arrival at the central train station of The Hague, I immediately got onto a light rail. The station is a terminus, and running perpendicular to the mainline rail tracks on an elevated platform is a line of The Hague’s tram system. 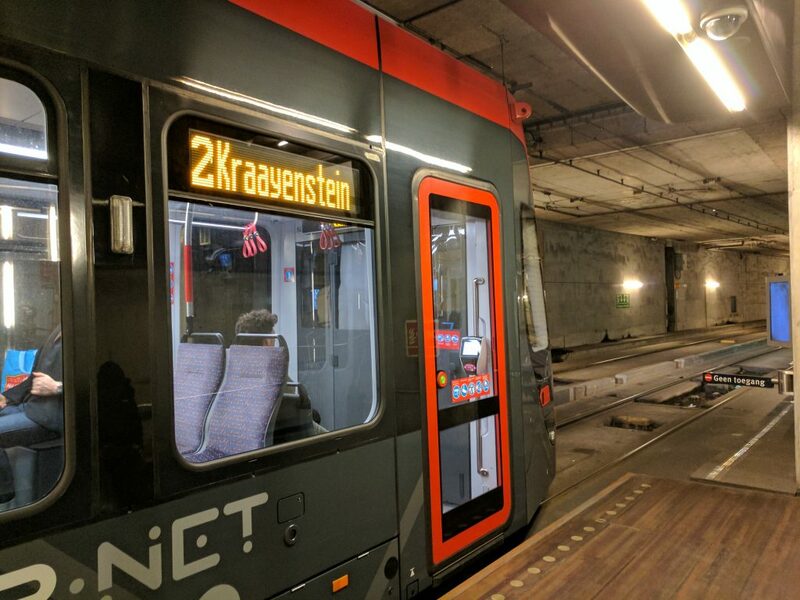 The Hague has a combination light rail, streetcar, and premetro system. The Hague’s Central Station: two levels of trains! As I like to do in new cities, I hopped on the first tram that came and rode it for a little while. Then I tuned back and took the tram to the city center. My first stop after emerging from the premetro was the VVV. There, I got a free map with the tourist highlights marked. From the VVV I walked to the Binnenhof, which is the seat of both Dutch houses of parliament. Built in the 13th century and in 1584 becoming the center of government in the Netherlands, the Binnenhof is the oldest House of Parliament in the world still in use. I took a Photo Sphere panorama inside the Binnenhof. Click here to go to Google Photos and view it in 360° (it looks best this way). 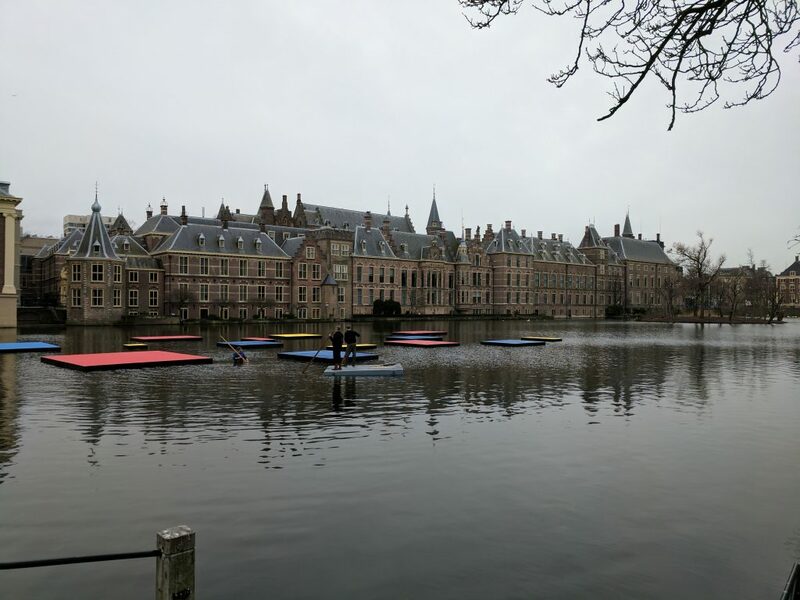 After visiting the Binnenhof, I continued on my walk to the Noordeinde Palace, one of the three official Royal palaces in the Netherlands, and the current working Palace of the King. It’s not open to the public, but it’s nice to see from the outside. The working place of King Willem-Alexander of the Netherlands. 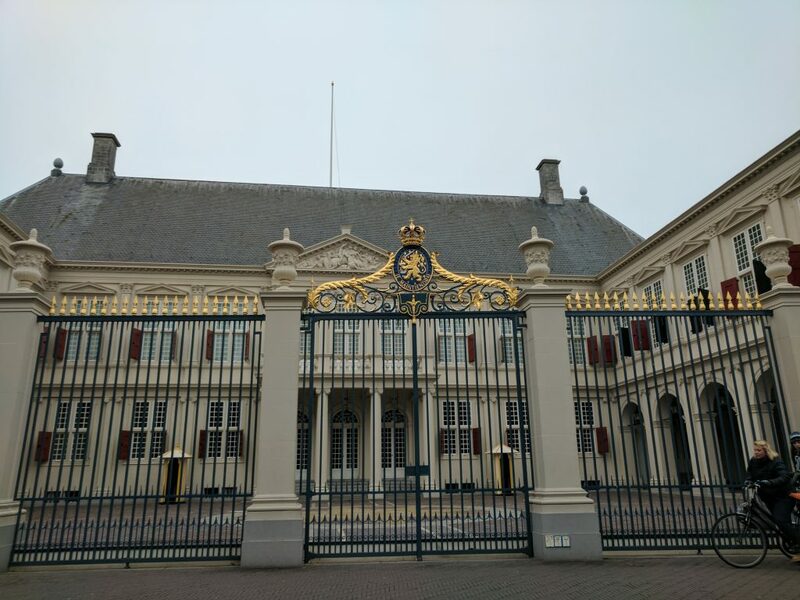 I continued walking to the other big attraction in The Hague: the Peace Palace. 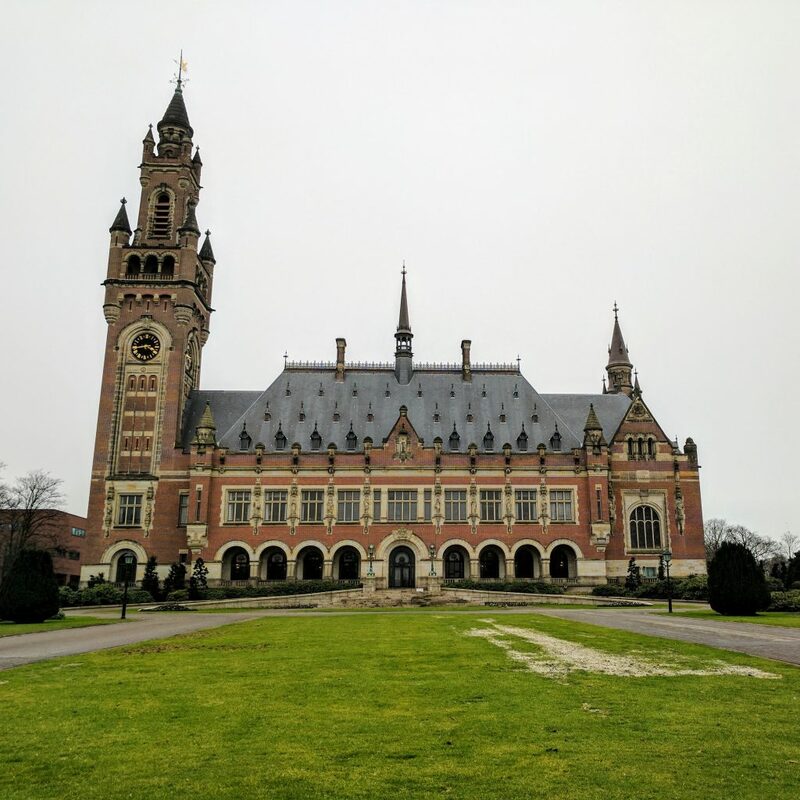 The Peace Palace is the home of the Permanent Court of Arbitration, and more famously the International Court of Justice. The Palace opened in 1913 and was built with money given by Andrew Carnegie. Before this, I had no idea that his philanthropic work extended beyond the US (let alone to building one of the fundamental institutions of the United Nations). The palace and visitor center are still today run and maintained by the Carnegie Foundation. I was only expecting to see the palace from the outside, given that it was a Saturday and that the woman in the VVV told me that it was totally closed. However, after arriving and admiring the building from beyond the perimeter fence, I noticed that the visitor center was open. It turns out that not only were they open, they were offering a guided tour of the palace starting in five minutes! I quickly paid the 10€ fee and followed the instructions: leave all your stuff including your phone in these lockers, but bring an ID. After leaving my things and going through airport-style security, the tour started. We had the opportunity to sit in the Permanent Court of Arbitration while learning about its history, procedures, and role in settling international disputes. Then, we continued to the International Court of Justice and sat in the upper gallery while learning about the Court. Overall the tour was amazing, and I learned so much about the two courts and the Peace Palace that houses them. By the time the tour was over, I was tired and ready for a break. I took the tram back to den Haag Centraal and got onto a train. It was around 17:30, the sun had set, and I didn’t really want to explore a city I wasn’t familiar with or hadn’t been to. 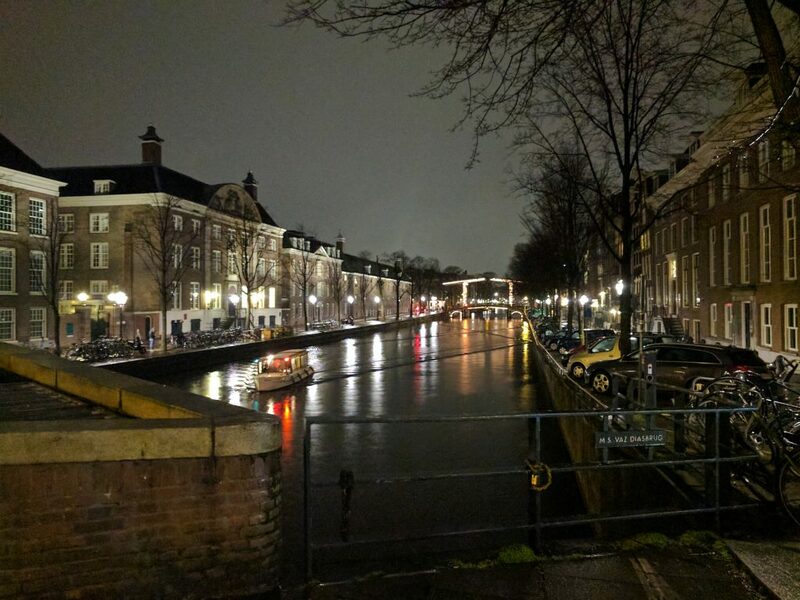 I had a choice to either head straight back to Groningen (where I was staying), or to stop in Amsterdam and have a nice walk on the beautiful canals. So instead of visiting Rotterdam (Europe’s largest port and one of the biggest in the world), I chose to visit Amsterdam. 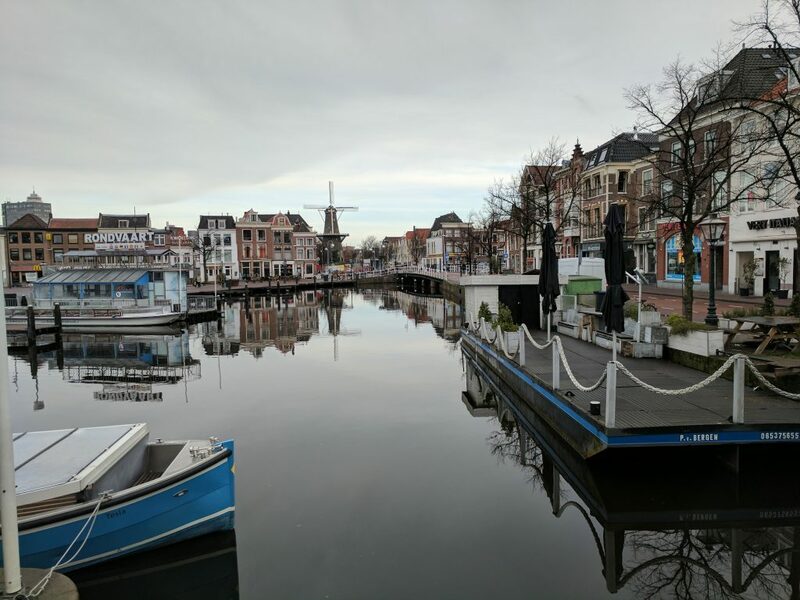 The train from The Hague to Amsterdam took around 55 minutes, and passed through, among other places, Haarlem, which is also high on my list of cities to visit. The train arrived at Amsterdam Centraal around 18:40. Because I had already visited Amsterdam and because all the museums and other attractions were closed, I decided that the best way to spend a couple of hours in Amsterdam would be to walk around and finish a multi-cache I had started on my last visit. This seemed like the perfect plan, since the cache was all about how Amsterdam is “built on poles” in a marsh and how the beautiful canal houses “sink” into the ground (a common sight in Amsterdam). Due to the darkness and rain, I didn’t really get any great pictures in Amsterdam, but this was one of the nicer ones. Unfortunately, it was raining when I arrived in Amsterdam, so I decided to cut my walk a bit by taking the metro a couple of stops to where the multi started. 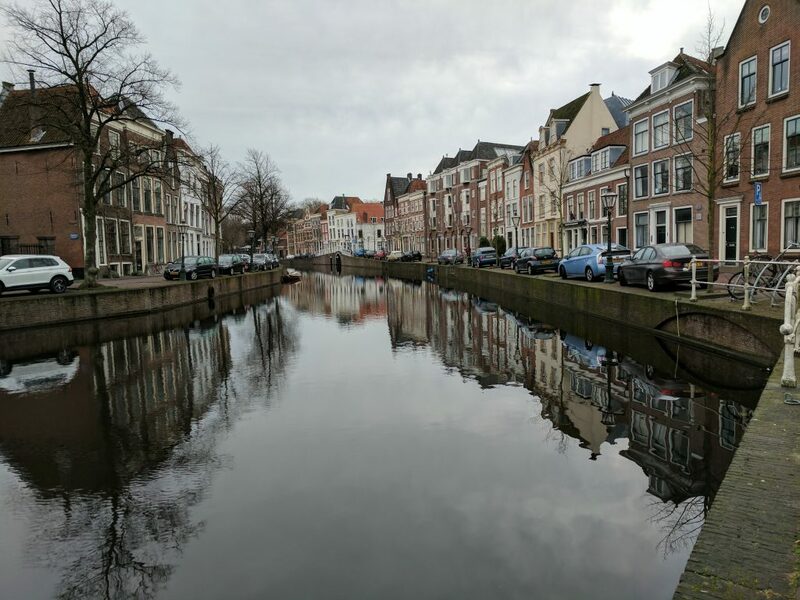 I had a very nice walk around, seeing beautiful canals, canal houses, and sinking houses. I made a silly mistake in solving the multi, so I ended up walking 15 minutes out of the way and got really wet digging in some bushes. Regardless, the overall experience was nice. 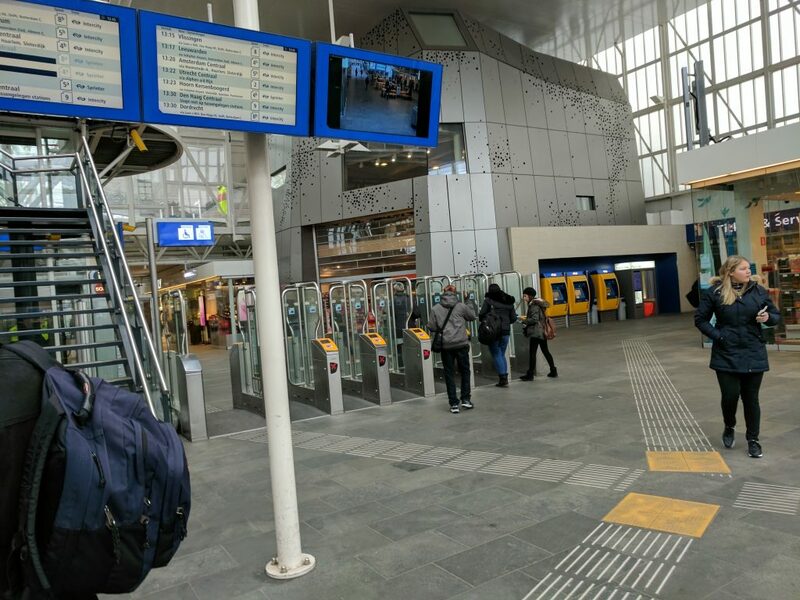 After finding the cache, I returned to the train station (Amsterdam Centraal) via the metro. I did some walking around in the station, looking at ticket machines and convenience stores, then got on a train back to Groningen.